Quick, name a European country that was ruled as a theocracy for three centuries before being absorbed into a larger federation of countries under a monarchy and then under communism before voting to be let out of what was left of said federation in 2006! If you guessed Montenegro, you're right! Which bring us to This Week In Vexillology- which, as you might have already guessed features the flag of none other than Montenegro itself! Adopted on July 13th, 2004- which, yes, technically, it before they declared independence- but I think they were heading that way anyway and changing the flag was just one more nail in the coffin of what was left of Yugoslavia. But interestingly enough, the proportion of the flag (1:2) did not actually shift with the change. 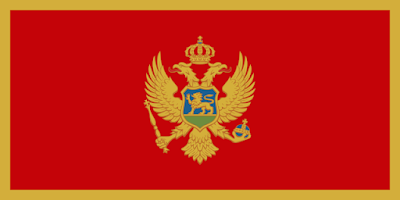 Even under communism and post-communist Yugoslavia, the Montenegrin flag was longer than it's counterparts. (Serbia's flag, for instance, has a more 'square' proportion of 2:3) While Montenegro used the usual pan-Slavic tricolor under Yugoslavia and then Serbia & Montenegro- the length and difference in size made it distinctive then and this change in flag makes it distinctive now. The two headed eagle appears again- we saw it in Serbia and it shows up in Albania as well. Again, this symbol dates back to Byzantine and ultimately Roman rule- so it goes back centuries, but the Montenegrin coat of arms seems to have been influenced more by the Coat of Arms of the Russian Empire- the ruling dynasty when the Arms were adopted in their present (it was the House of Petrovic-Njegos and my apologies for the lack of appropriate accents/diacritical marks). The two heads of the eagle symbolize the divided authority between church and state- which is also why one eagle has a sceptre in one claw and a cruciger in the other. The lion in the center is probably the most interesting part of the whole darn thing-- it's either inspired by the Lion of Judah (another nod to the religious/theocratic nature of Montenegro's past) or it's taken from a similar motif from the arms of Venice, which controlled parts of Montenegro in the past. And that's the flag of Montenegro, kids. Remember, until next time, keep your flags flying- FREAK or otherwise!